Fred Warner (2014–17): The rookie 49ers linebacker recorded eight tackles in a 43-16 loss to the Seattle Seahawks. Warner is currently 10th in the NFC with 92 total tackles this season. Daniel Sorensen (2008, 2011–13): The Chiefs safety recorded two tackles with a pass deflection in a 40-33 victory over the Oakland Raiders. Kyle Van Noy (2010–13): Van Noy recorded five tackles with a quarterback hit in the Patriots 24-10 win over the Minnesota Vikings. 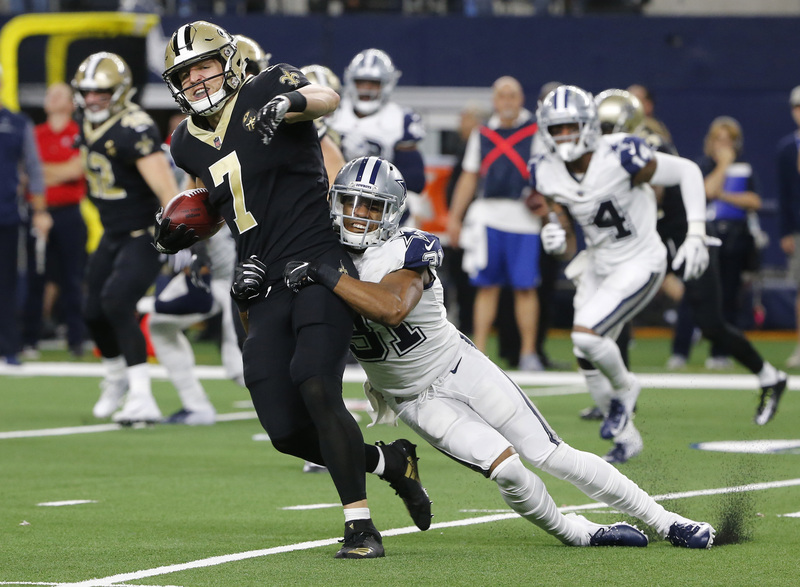 Taysom Hill (2012–16): Hill didn’t have any offensive touches or special teams tackles in a 13-10 loss to the Dallas Cowboys. Hill did return two kicks for 47 yards, however. The Saints are now 0-2 on the season when Hill has no offensive touches (10-0 when he does). Michael Davis (2013–16): Davis started again for the Chargers on Sunday Night Football and recorded a tackle in a thrilling 33-30 comeback victory over the Pittsburgh Steelers. Jamaal Williams (2012–16): Williams ran seven times for 13 yards, caught four passes for 14 yards and returned three kicks for 72 yards in a 20-17 upset loss to the Arizona Cardinals. With Packers head coach Mike McCarthy’s firing after the game, Williams could potentially see more playing time with a new head coach in the future.